Allen on his pony overseeing works. Introduced to the game by his father, an ex- Austrian cavalry captain, who liked to patch up broken-down horses, Allen gave up the ghost of his original dream of being a race rider rather early and turned to training in 1950. He won his first race that year fittingly on the 4th of July, when a runner named Populace scored at Aqueduct. A dozen years after his first win, fate put Wall Street investor Jack Dreyfus, Jr., at his doorstep and a long association with Hobeau Farm began. 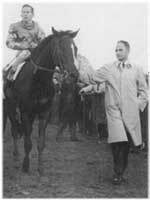 In 1962 Allen took over Dreyfus' Hobeau Stable and saddled Beau Purple to upset champion Kelso on three separate occasions. His horses also upset champions Cicada, Buckpasser, Secretariat, Riva Ridge, and Forego, and he got the nickname the "Giant Killer." He actually does not like this nickname much and is tired of the fact that it is trotted out so tirelessly by the press. Around the barn he is called the "CHIEF." None the less, Allen Jerkens, has a history of sending out horses to upset champions. Since saddling his first winner in 1950, the New York-born Jerkens has probably provided this sport with more high-profile upsets than any other conditioner. He sent Beau Purple out to defeat the great Kelso three times in 1962-63, and Handsome Boy to upset Buckpasser in the '67 Brooklyn Handicap. In the latter part of 1973, Jerkens-trained Onion and Prove Out achieved what many then thought impossible—defeating Secretariat in the Whitney (G2) and Woodward (G1) Stakes, respectively. Those defeats of the reigning Horse of the Year led to Jerkens's Eclipse Award as outstanding North American trainer of 1973. Two years later, at age 45, he became the youngest trainer to be inducted into Racing's Hall of Fame, despite not yet developing an officially designated champion. His first champion arrived on the scene years later in the form of Sky Beauty, Eclipse Award-winning older female of 1994. Other outstanding Jerkens-trained runners have included multiple Grade 1 winner Devil His Due, who won the Gotham and Wood in ‘92 and the Pimlico Special, Suburban, and Excelsior the next season, Believe The Queen, who won the ‘84 TomFool, Missy’s Mirage, who won the First Flight in ‘91, the Shuvee, Hempstead, and Gay Matelda in ‘92, and the Correction in ‘92 and ’93, Sky Beauty, who parlayed the Adirondack to the Matron in ‘92, then added the Acorn, Mother Goose, CCA Oaks, and Alabama the next year, as well as recent multiple graded-stakes winners November Snow, Kelly Kip, Dixie Flag, and Shine Again.